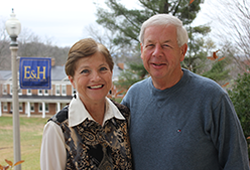 From time to time and out of devotion to her alma mater, Heda Jones Quillin ('72) has provided fill-in service for absent employees in the Emory & Henry office that deals with financial aid, known as the Centralized Student Assistance office. It is work that brings her close to E&H students and often the challenges they face in financing their education. "That experience has really opened my eyes. I have come to realize that there are so many students that must have financial aid in order to remain at Emory & Henry and that the College is as affordable if not less expensive than a lot of places because of that financial aid." Her service to the financial aid office also reminds her of the generosity that made her own E&H education affordable. The child of a Methodist minister, Heda who became a school teacher recalls that although her father saved fastidiously for her education she still depended on financial support from the institution. "I could not have attended Emory & Henry without it." With this perspective on student financial aid, Heda has been inspired to establish with the College charitable gift annuities that provide her with tax deductible income during her retirement and a sizeable gift to the College upon her death. The gift will add to an endowed scholarship in honor of Heda's parents, Arthur H. and Rosemary J. Jones, which was established by Heda, husband Dr. Charlie Quillin ('70), brother Dr. Heath Jones ('69) and wife Julie, and brother Dr. Martin Jones ('74) and wife Karen Tilley Jones ('75). While Heda's generosity was inspired by her experiences, the idea of providing a planned gift came from Charlie, a former vice president for development at Emory & Henry. "We saw what other people whom we respected were doing through planned giving instruments and quite frankly they inspired us." Charlie said. "There are so many wonderful students at Emory & Henry who are excited about learning," Heda said. "How can you not feel good about doing something for them? You can't take it with you, so why not make plans now for helping these students."